Odin is the inspiration for this fantasy image. All cats have rich imaginations involving real or fantasy prey ( in this case my feet). Some cats, like Odin, are more mischievous and can wreak havoc without some training. Cat Training? Fact or fantasy? 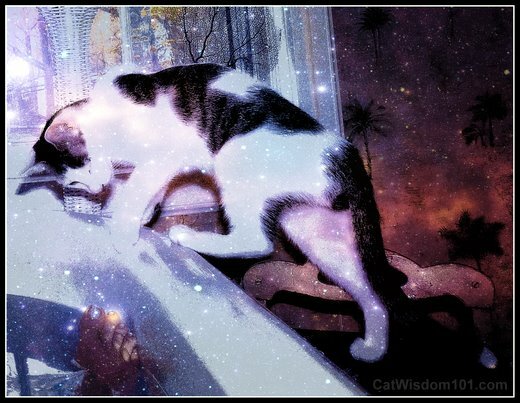 Do you dream of having your cat behave and respond to your every wish? Or have your cat perform like a TV professional? 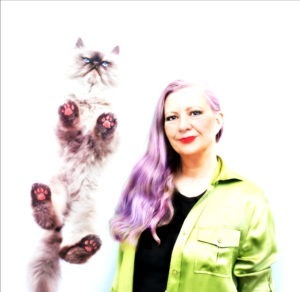 Miriam Fields-Babineau trains cats for a living for film and TV, but this book won’t make your kitty a slave, let alone star. What it can do, is teach basic clicker training and simple commands like come, sit and stay. There are clear step-by-step photographs of cats going through their paces. I’m not a fan of clicker training. I find verbal commands with hand cues and treat rewards, work just as well. No cat is going to do anything unless they want to, but if your cat responds to treats, she can learn basic training in several sessions of 10 minutes each. Daily consistent training is key. The ideal candidate is young adult or kitten. I primarily wanted to train Odin from running out the front door. Thus far, it only works if I’m nearby. If the door is open and I’m not close, it’s good-bye prison, hello world! Odin is an excellent candidate and there is more training in his future. I wouldn’t dream of using it on older cats like Gris Gris or Merlin who are set in their ways, super smart and evolved. They respond to commands but only on their terms. All smart cats are masters at training humans but cat training is no joke. I’ll leave you with one anyway. “A woman is walking in the park when she sees a man playing chess with his cat. She says to the man “I can’t believe what I’m seeing, a cat that plays chess, what a clever animal! !” The man replied “Nah lady this cats not clever at all I’m beating it 6 games to 1”. 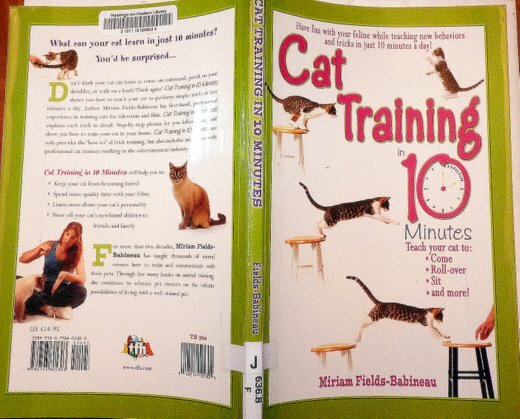 Cat Training In 10 Minutes by Miriam Fields-Babineau. Published 2003. 142 pages. Soft cover. But I got some friend in FB, which been trained since he was a kitten, but Mom said she is happy the way I am and I don’t need to be train because she love the way cat is : ) ….. Stubborn and Mischief ! My crew all comes when I whistle, it started when I had a dog 20 years ago and the cats learned from him; and through the years the newbies have learned from the residents that a whistle means something good like a treat or play or a little forced snuggling, heh heh. Same here. The old ones teach the new ones the drill. Positive reinforcement is a quick teacher. the final quote was right on the money! I am also not a fan of clicker training, I find it to be highly annoying. I am lucky that I was able to train both of my cats quite well in a variety of areas. Ultimately, you are correct, a cat will do what he/she WANTS to do. I have mixed feelings about clicker training for cats. I know it can work really well, but to me, it has an element of “brain washing” that does not appeal to me when used with intelligent and independent creatures like cats. I did change my view on it somewhat, though, after attending a workshop with Dr. Nicholas Dodman. His point was that clicker training can actually enhance the relationship between cat and human. However, I still wonder whether it’s the clicker or the fact that the human spends more time with the cat when they work on training them, regardless of what method is used. I think it also depends on the cat. Some cats will respond to being trained to do tricks, others will not enjoy it. It’s all about the individual. LOL at the joke. I agree that some cats can be trained if it is started when they are young enough. Austin comes when called and I can almost get him to do anything if his brush is involved. Playing chess is next on the list lol. He thinks I’m his mother so that helps!